Homecoming week is always filled with tradition, energy, and activities on and off campus. This year, George Mason University and Fairfax City partnered together to celebrate their 2019 Homecoming. 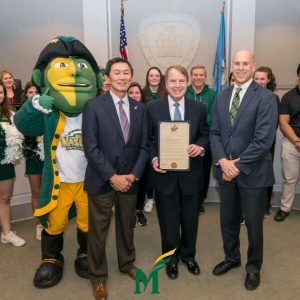 The City kicked Homecoming off by issuing a proclamation announcing the month of February as “George Mason University Month”. 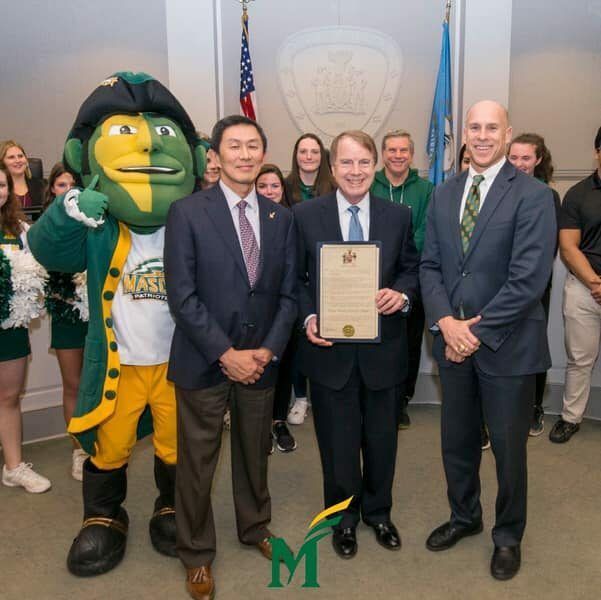 Mayor David Meyer and City Councilmembers presented the proclamation on Tuesday, January 22 to University Provost and Executive VP David Wu, Assistant VP and Director of Athletics Brad Edwards, and Mason student athletes and organizations. To collectively celebrate and unify the University and City, Old Town Fairfax City businesses are taking part in activities and offering deals to students, faculty, staff, and alumni from Monday, February 18 through Saturday, February 23. The week is packed with events, from a Tip-Off Party to Paint the City Green to Patriots in the City. The weeklong celebration ends with the Homecoming game against Duquesne on Saturday, February 23 at 4:00 pm. Make sure to check out fairfaxcityconnected.com/masonhomecoming for details on all the events and discounts! Error: Error validating access token: Session has expired on Tuesday, 21-Aug-18 08:56:08 PDT. The current time is Sunday, 21-Apr-19 21:48:45 PDT.